Ordinary experience provides no clue of this principle. It is easy to measure both the position and the velocity of, say, an automobile, because the uncertainties implied by this principle for ordinary objects are too small to be observed. The complete rule stipulates that the product of the uncertainties in position and velocity is equal to or greater than a tiny physical quantity, or constant (about 10-34 joule-second, the value of the quantity h (where h is Planck's constant). Only for the exceedingly small masses of atoms and subatomic particles does the product of the uncertainties become significant. Any attempt to measure precisely the velocity of a subatomic particle, such as an electron, will knock it about in an unpredictable way, so that a simultaneous measurement of its position has no validity. This result has nothing to do with inadequacies in the measuring instruments, the technique, or the observer; it arises out of the intimate connection in nature between particles and waves in the realm of subatomic dimensions. Every particle has a wave associated with it; each particle actually exhibits wavelike behavior. The particle is most likely to be found in those places where the undulations of the wave are greatest, or most intense. The more intense the undulations of the associated wave become, however, the more ill defined becomes the wavelength, which in turn determines the momentum of the particle. So a strictly localized wave has an indeterminate wavelength; its associated particle, while having a definite position, has no certain velocity. A particle wave having a well-defined wavelength, on the other hand, is spread out; the associated particle, while having a rather precise velocity, may be almost anywhere. A quite accurate measurement of one observable involves a relatively large uncertainty in the measurement of the other. The uncertainty principle is alternatively expressed in terms of a particle's momentum and position. The momentum of a particle is equal to the product of its mass times its velocity. Thus, the product of the uncertainties in the momentum and the position of a particle equals h/(2) or more. The principle applies to other related (conjugate) pairs of observables, such as energy and time: the product of the uncertainty in an energy measurement and the uncertainty in the time interval during which the measurement is made also equals h/(2) or more. The same relation holds, for an unstable atom or nucleus, between the uncertainty in the quantity of energy radiated and the uncertainty in the lifetime of the unstable system as it makes a transition to a more stable state. 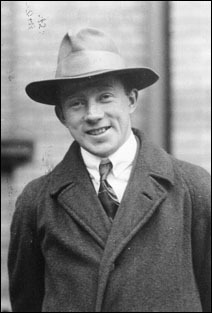 The uncertainty principle, developed by W. Heisenberg, is a statement of the effects of wave-particle duality on the properties of subatomic objects. Consider the concept of momentum in the wave-like microscopic world. The momentum of wave is given by its wavelength. A wave packet like a photon or electron is a composite of many waves. Therefore, it must be made of many momentums. But how can an object have many momentums? Of course, once a measurement of the particle is made, a single momentum is observed. But, like fuzzy position, momentum before the observation is intrinsically uncertain. This is what is know as the uncertainty principle, that certain quantities, such as position, energy and time, are unknown, except by probabilities. In its purest form, the uncertainty principle states that accurate knowledge of complementarity pairs is impossible. For example, you can measure the location of an electron, but not its momentum (energy) at the same time. A characteristic feature of quantum physics is the principle of complementarity, which "implies the impossibility of any sharp separation between the behavior of atomic objects and the interaction with the measuring instruments which serve to define the conditions under which the phenomena appear." As a result, "evidence obtained under different experimental conditions cannot be comprehended within a single picture, but must be regarded as complementary in the sense that only the totality of the phenomena exhausts the possible information about the objects." This interpretation of the meaning of quantum physics, which implied an altered view of the meaning of physical explanation, gradually came to be accepted by the majority of physicists during the 1930's. This is perhaps the most famous equation next to E=mc2 in physics. It basically says that the combination of the error in position times the error in momentum must always be greater than Planck's constant. So, you can measure the position of an electron to some accuracy, but then its momentum will be inside a very large range of values. Likewise, you can measure the momentum precisely, but then its position is unknown. Notice that this is not the measurement problem in another form, the combination of position, energy (momentum) and time are actually undefined for a quantum particle until a measurement is made (then the wave function collapses). Also notice that the uncertainty principle is unimportant to macroscopic objects since Planck's constant, h, is so small (10-34). For example, the uncertainty in position of a thrown baseball is 10-30 millimeters. The depth of the uncertainty principle is realized when we ask the question; is our knowledge of reality unlimited? The answer is no, because the uncertainty principle states that there is a built-in uncertainty, indeterminacy, unpredictability to Nature. The field of quantum mechanics concerns the description of phenomenon on small scales where classical physics breaks down. The biggest difference between the classical and microscopic realm, is that the quantum world can be not be perceived directly, but rather through the use of instruments. And a key assumption to an quantum physics is that quantum mechanical principles must reduce to Newtonian principles at the macroscopic level (there is a continuity between quantum and Newtonian mechanics). Quantum mechanics was capable of bringing order to the uncertainty of the microscopic world by treatment of the wave function with new mathematics. Key to this idea was the fact that relative probabilities of different possible states are still determined by laws. Thus, there is a difference between the role of chance in quantum mechanics and the unrestricted chaos of a lawless Universe. Every quantum particle is characterized by a wave function. In 1925 Erwin Schrodinger developed the differential equation which describes the evolution of those wave functions. By using Schrodinger equation, scientists can find the wave function which solves a particular problem in quantum mechanics. Unfortunately, it is usually impossible to find an exact solution to the equation, so certain assumptions are used in order to obtain an approximate answer for the particular problem. The difference between quantum mechanics and newtonian mechanics is the role of probability and statistics. While the uncertainty principle means that quantum objects have to be described by probability fields, this doesn't mean that the microscopic world fails to conform to deterministic laws. In fact it does. And measurement is an act by which the measurer and the measured interact to produce a result. Although this is not simply the determination of a preexisting property. The quantum description of reality is objective (weak form) in the sense that everyone armed with a quantum physics education can do the same experiments and come to the same conclusions. Strong objectivity, as in classical physics, requires that the picture of the world yielded by the sum total of all experimental results to be not just a picture or model, but identical with the objective world, something that exists outside of us and prior to any measurement we might have of it. Quantum physics does not have this characteristic due to its built-in indeterminacy. For centuries, scientists have gotten used to the idea that something like strong objectivity is the foundation of knowledge. So much so that we have come to believe that it is an essential part of the scientific method and that without this most solid kind of objectivity science would be pointless and arbitrary. However, the Copenhagen interpretation of quantum physics (see below) denies that there is any such thing as a true and unambiguous reality at the bottom of everything. Reality is what you measure it to be, and no more. No matter how uncomfortable science is with this viewpoint, quantum physics is extremely accurate and is the foundation of modern physics (perhaps then an objective view of reality is not essential to the conduct of physics). And concepts, such as cause and effect, survive only as a consequence of the collective behavior of large quantum systems. In 1935 Schrodinger, who was responsible for formulating much of the wave mechanics in quantum physics, published an essay describing the conceptual problems in quantum mechanics. A brief paragraph in this essay described the, now famous, cat paradox. One can even set up quite ridiculous cases where quantum physics rebells against common sense. For example, consider a cat is penned up in a steel chamber, along with the following diabolical device (which must be secured against direct interference by the cat). In the device is a Geiger counter with a tiny bit of radioactive substance, so small that perhaps in the course of one hour only one of the atoms decays, but also, with equal probability, perhaps none. If the decay happens, the counter tube discharges and through a relay releases a hammer which shatters a small flask of hydrocyanic acid. If one has left this entire system to itself for an hour, one would say that the cat still lives if meanwhile no atom has decayed. The first atomic decay would have poisoned it. The wave function for the entire system would express this by having in it the living and the dead cat mixed or smeared out in equal parts. It is typical of these cases that an indeterminacy originally restricted to the atomic domain becomes transformed into macroscopic indeterminacy, which can then be resolved by direct observation. That prevents us from so naively accepting as valid a ``blurred model'' for representing reality. In itself it would not embody anything unclear or contradictory. There is a difference between a shaky or out-of-focus photograph and a snapshot of clouds and fog banks. We know that superposition of possible outcomes must exist simultaneously at a microscopic level because we can observe interference effects from these. We know (at least most of us know) that the cat in the box is dead, alive or dying and not in a smeared out state between the alternatives. When and how does the model of many microscopic possibilities resolve itself into a particular macroscopic state? When and how does the fog bank of microscopic possibilities transform itself to the blurred picture we have of a definite macroscopic state. That is the collapse of the wave function problem and Schrodinger's cat is a simple and elegant explanation of that problem. The macroscopic world is Newtonian and deterministic for local events (note however that even the macroscopic world suffers from chaos). On the other hand, the microscopic quantum world radical indeterminacy limits any certainty surrounding the unfolding of physical events. Many things in the Newtonian world are unpredictable since we can never obtain all the factors effecting a physical system. But, quantum theory is much more unsettling in that events often happen without cause (e.g. radioactive decay). Note that the indeterminacy of the microscopic world has little effect on macroscopic objects. This is due to the fact that wave function for large objects is extremely small compared to the size of the macroscopic world. Your personal wave function is much smaller than any currently measurable sizes. And the indeterminacy of the quantum world is not complete because it is possible to assign probabilities to the wave function. But, as Schrodinger's Cat paradox show us, the probability rules of the microscopic world can leak into the macroscopic world. The paradox of Schrodinger's cat has provoked a great deal of debate among theoretical physicists and philosophers. Although some thinkers have argued that the cat actually does exist in two superposed states, most contend that superposition only occurs when a quantum system is isolated from the rest of its environment. Various explanations have been advanced to account for this paradox--including the idea that the cat, or simply the animal's physical environment (such as the photons in the box), can act as an observer. The question is, at what point, or scale, do the probabilistic rules of the quantum realm give way to the deterministic laws that govern the macroscopic world? This question has been brought into vivid relief by the recent work where an NIST group confined a charged beryllium atom in a tiny electromagnetic cage and then cooled it with a laser to its lowest energy state. In this state the position of the atom and its "spin" (a quantum property that is only metaphorically analogous to spin in the ordinary sense) could be ascertained to within a very high degree of accuracy, limited by Heisenberg's uncertainty principle. The workers then stimulated the atom with a laser just enough to change its wave function; according to the new wave function of the atom, it now had a 50 percent probability of being in a "spin-up" state in its initial position and an equal probability of being in a "spin-down" state in a position as much as 80 nanometers away, a vast distance indeed for the atomic realm. In effect, the atom was in two different places, as well as two different spin states, at the same time--an atomic analog of a cat both living and dead. The clinching evidence that the NIST researchers had achieved their goal came from their observation of an interference pattern; that phenomenon is a telltale sign that a single beryllium atom produced two distinct wave functions that interfered with each other. The modern view of quantum mechanics states that Schrodinger's cat, or any macroscopic object, does not exist as superpositions of existence due to decoherence. A pristine wave function is coherent, i.e. undisturbed by observation. But Schrodinger's cat is not a pristine wave function, its is constantly interacting with other objects, such as air molecules in the box, or the box itself. Thus a macroscopic object becomes decoherent by many atomic interactions with its surrounding environment. Decoherence explains why we do not routinely see quantum superpositions in the world around us. It is not because quantum mechanics intrinsically stops working for objects larger than some magic size. Instead, macroscopic objects such as cats and cards are almost impossible to keep isolated to the extent needed to prevent decoherence. Microscopic objects, in contrast, are more easily isolated from their surroundings so that they retain their quantum secrets and quantum behavior. One of the surprising results of quantum physics is that if a physical event is not specifically forbidden by a quantum rule, than it can and will happen. While this may strange, it is a direct result of the uncertainty principle. Things that are strict laws in the macroscopic world, such as the conversation of mass and energy, can be broken in the quantum world with the caveat that they can only broken for very small intervals of time (less than a Planck time). The violation of conservation laws led to the one of the greatest breakthroughs of the early 20th century, the understanding of radioactivity decay (fission) and the source of the power in stars (fusion). Nuclear fission is the breakdown of large atomic nuclei into smaller elements. This can happen spontaneously (radioactive decay) or induced by the collision with a free neutron. Spontaneously fission is due to the fact that the wave function of a large nuclei is 'fuzzier' than the wave function of a small particle like the alpha particle. The uncertainty principle states that, sometimes, an alpha particle (2 protons and 2 neutrons) can tunnel outside the nucleus and escape. Induced fission occurs when a free neutron strikes a nucleus and deforms it. Under classical physics, the nucleus would just reform. However, under quantum physics there is a finite probability that the deformed nucleus will tunnel into two new nuclei and release some neutrons in the process, to produce a chain reaction. Fusion is the production of heavier elements by the fusing of lighter elements. The process requires high temperatures in order to produce sufficiently high velocities for the two light elements to overcome each others electrostatic barriers. Even for the high temperatures in the center of a star, fusion requires the quantum tunneling of a neutron or proton to overcome the repulsive electrostatic forces of an atomic nuclei. Notice that both fission and fusion release energy by converting some of the nuclear mass into gamma-rays, this is the famous formulation by Einstein that E=mc2. Although it deals with probabilities and uncertainties, the quantum mechanics has been spectacularly successful in explaining otherwise inaccessible atomic phenomena and in meeting every experimental test. Its predictions are the most precise and the best checked of any in physics; some of them have been tested and found accurate to better than one part per billion. A combination of quantum mechanics and relativity allows us to examine subatomic processes in a new light. Symmetry is very important to physical theories. Thus, the existence of a type of `opposite' matter was hypothesized soon after the development of quantum physics. `Opposite' matter is called antimatter. Particles of antimatter has the same mass and characteristics of regular matter, but opposite in charge. When matter and antimatter come in contact they are both instantaneously converted into pure energy, in the form of photons. In this interpretation, the collision of an electron and two photons causes the electron to go backward in time till it meets another pair of photons, then reverses itself again. The world of quantum physics allows for many such strange views of subatomic interactions.